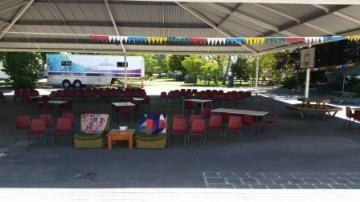 How our school prepared for the Big Day! Friday - The night before 'Happy Birthday'! 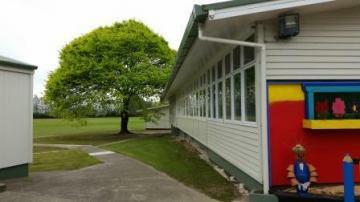 Saturday - Happy Birthday Edgecumbe Primary School! EPS finally plants our trees! What were other people doing to prepare for the big celebration? 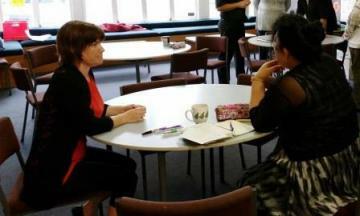 Whaea Niki and Mrs Carter are thinking about the jobs they can choose from the list...oh so many! 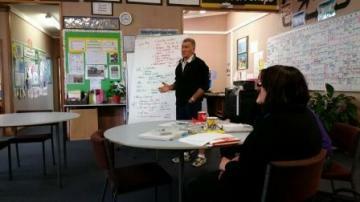 Here are some of the staff choosing their roles and jobs from Mr Brebner's 'TO DO LIST'. There was another board and both boards had more jobs on the backs! There were lots of jobs being done over lots of weeks that people could see happening. There were also many jobs that were being done quietly that people didn't get to see and many of these were done by the Jubilee Committee. What happened to our school? 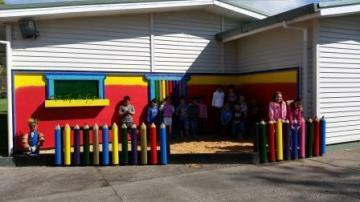 Our school buildings got 'fixed up', a 'big clean up' and then a 'big make over'! ...no hole! Ready for the visitors on Saturday. Mr Burke spent time preparing the school buildings ready for the painters to come in. 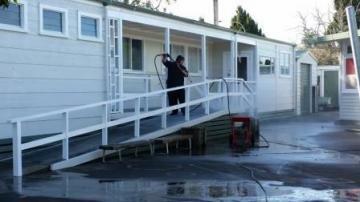 Here Mr Burke is just giving the outside a 'spruce up' with the water blaster. 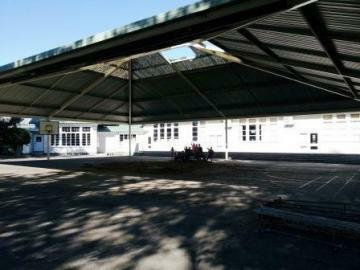 Mr Burke, Whaea Fredrika and Whaea Trini (the cleaning team) were awesome because they cleaned all the classrooms and the buildings - inside and out! They also gave the toilets a good cleaning and told Mr Burke if anything needed fixing or replacing. Mr Haimona (our ICT and everything-else-teacher) helped too. One of the big jobs Mr Haimona had to do was to make sure anything ICT that was going to be used in the Jubilee celebrations would be fine and working (eg microphones, speakers). Some of this gear had to be sent away and fixed. Mr Haimona helped Mr Burke clear branches away from the builings like when this big tree, at the back of Room 7, got a 'hair cut'. Some of the teachers helped Mr Burke clear the branches too. Mr Lees - 'Matt's Mulchers' - (Whaea Lesa's partner) came in voluntarily and mulched the branches into small chips so Mr Burke didn't need to have the branches taken away in trailers. Whew! It only took about an hour or two to get the job done. 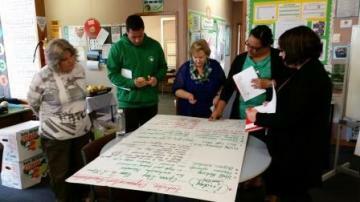 Whaea Jeanette, Whaea Joelle, Mr Haimona and Mr Burke are in the photograph below. 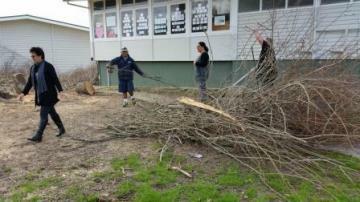 Whaea Trini and her sons Puhi and Te Rei as well as Whaea Sarah and her son Thomas, also came to help clear the branches. Whaea Lesa (taking the photographs) was helping with her son Ethan but you can't see them either! Matua Nui (Whaea Trini's husband) also came in to help Mr Burke water-blast the buildings and do other jobs around the school on the days he didn't have to go to his real job! Mr Burke also cleaned and cleared the gardens around the school so our school looked better than usual - and our school looks pretty clean on most days. 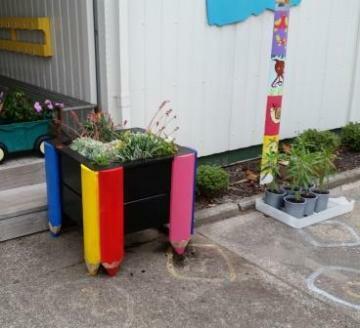 ...and pencil art for this Room 11 planter box. Mr Burke had another 'secret' project he was working on at the time of the Jubilee celebrations but he didn't quite finish it on time! He installed the latest feature on the Monday after the celebrations had finished - What a shame! 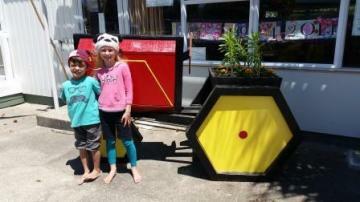 This tractor / planter is now outside Room 11, seen here with Sophie (who was in our 'Discovering Edgecumbe' story from 2013) and Max. The school was looking SUPER AWESOME! Room 7 children were getting very excited because of everything that was happening around the school. We felt ready to greet our special visitors and to show them how cool our classroom and school are!